Henriette von Muenchhausen creates volatile communities of objects which are out to seduce the viewer. Her works – mainly sculptures, drawings and short videos – are often fed by memories and tend to be of ambivalent nature. They possess the power of transformation and speak of joy as well as of darker elements of life. Often I pick a clear image of a previous or current work - for instance a crocodile made out of bathing foam, hanging in the air on a transparent sheet of plexiglass - and tell why and how I made it. I always am in search of the ridiculous. If I have to laugh or think "this is really silly!" during the process, I know I am on the right track. The following step is to work hard and reach the right amount of seriousness and attention - without shooing away the ridiculous elements completely. Play also is essential. It is what I am doing in my mind and in the studio nearly all the time. It starts or alters the works. Together with fights and doubts of course. Playing is also an important part of flirting and seducing, and that is what I want my work to do with the viewer. Both, humour and play, give freedom. They let me discover unexpected sides in my work during the process and they allow the viewer to look at the work and draw his or her own conclusions. I grew up with poetry, mainly French and German like Baudelaire, Nerval, Rilke or Morgenstern. Poetry still is an important source. I do not read poems a lot anymore. Poetry now lives inside me, and every now and then I put it in my titles and short texts accompanying my work. I also grew up with Federico Fellini’s films which made a big impression on me back then. Later on, films like “Let the right one in” by Tomas Alfredson, “Conspirators of Pleasure” by Jan Svankmajer or “Totoro” by Hayao Miyazaki joined the list of my favourite films, to name a few. Everyone of them evokes an own universe, something I am drawn to. I imagine my works to live in their own universe, too. Books which are important for me are for example Tove Jansson’s “Sculptor’s daughter”, “Treideln” by Juli Zeh and Lutz Seiler’s “Kruso”. The authors tell (probably autobiographical) stories in a witty and poetic way which makes me wanting to go on and read more and more of it. I wish I could add “A la recherche du temps perdu” by Marcel Proust, but somehow I always get stuck when I try to read it. Maybe the time has still to come to open up the book for me. I also like graphic novels, especially when text and image only relate in an associative manner to each other, so that I have got the feeling I do not get it completely. This gives me freedom as a reader, a similar freedom I wish the viewer of my work can experience. An example is “Plus si entente” by Dominique Goblet and Kai Pfeiffer, another one “Een boek waarmee men vrienden maakt” by Lukas Verstraete. Another important book for me is “Wilder Mann” by Charles Fréger. It is a photo book about the folklore tradition in many European countries in which people dress up as “wild men”, often in order to chase away winter. The Living: Amy Sillman, Charles Avery, Mika Rottenberg, Joseba Eskubi, Sean Lynch, Erkka Nissinen, Ragnar Kjartasson (The Visitors), Gijs Assman. Also there is quite some exciting work by my - not yet famous - peers and friends in the artworld! It is an “anti-squat”-situation; the company who is responsible for the space can tell all users one month in advance that they have to leave and find something else. On the one hand, this does not really make me feel at home there obviously, but on the other hand it also keeps me alert. And every now and then I can discover another, nearly abandoned space. A lovely question! I have endless spotify lists with a broad range of music. Music nearly always surrounds me when I am working. Sometimes the rhythm is important - and makes me dance alone in the studio, - sometimes it is the text which inspires me. It is hard to stop! The need to perform has to come out of the inner development of my work, and it is time again to do so apparently. Plus I have the opportunity to perform during an artist fair (This Art Fair) in Amsterdam, NL, at the end of December. 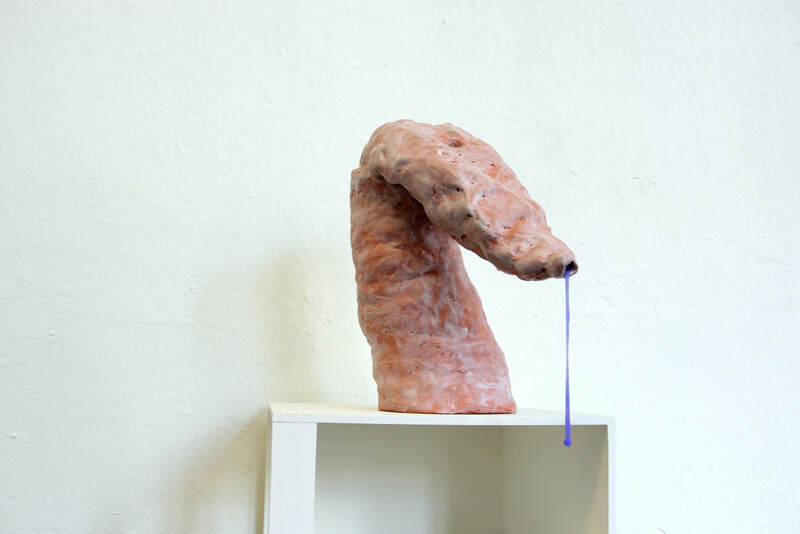 A lot of my sculptures have an performative element or suggest movement. Secretly, I think that they are doing all kinds of stuff when I am not around. When I install them, most of the time it is me who has to carry them to the exhibition space, which is funny (especially if they are big or very coloured) and exhausting at the same time. Once they are installed, I am superfluous. They want to be on their own. But this time I want to join the party. I want to know how it is to be installed. I will drag around my work and install it and myself (in a more or less tongue-shaped costume) for a while and then move to the next place every now and then at a different place. At the moment I am reading texts by Allan Kaprow about Happenings in the 1960s, because I feel that the unexpectedness and openness of this concept is exactly what I am looking for. I do not want an official public or fixed moments or a closed room like in a theater. Like with my work, I just wanna do my own stuff, and when I surprise some passers-by while doing so, that is fine. If you are curious, keep an eye on my website! Haha, not really! Only strange anecdotes. Like the one of the two sisters who used to live in my father’s house long time ago. My father heard them giggling often when he was a child, and one day he peeked through the keyhole and saw them sitting naked on a vacuum cleaner which was dragged around by their common lover. 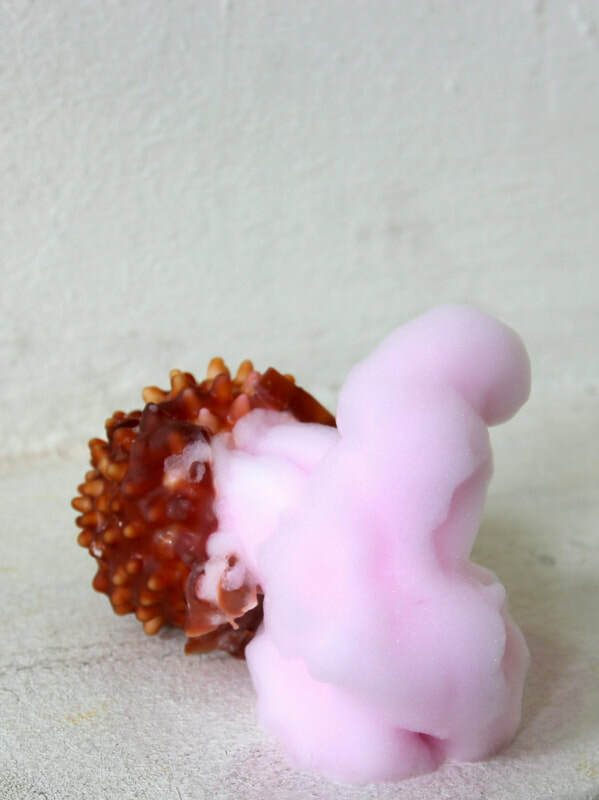 ​Image details: Henriette von Muenchhausen Snail (2017) latex, bathing-foam, dimensions variable.